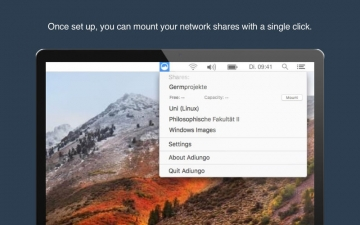 [無料] Adiungo - mount your shares | Mac App Storeのアプリ検索・ランキング BuzzMac! Once set up, you can mount and eject your network shares with a single click. Adiungo ensures that your network drives always stay connected. 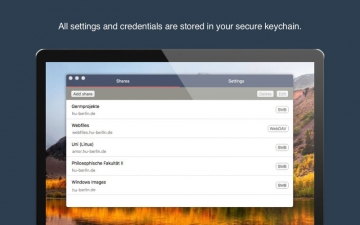 All settings and credentials are stored in your secure keychain. Create rules on the basis of network properties to determine when Adiungo should mount or eject a network drive. Cancels the limit (1 share) on the number of network shares and allows an unlimited number of network shares to be set up.